-- robust beams and post columns create an open space. A nostalgic drama of the history begins now. The residence of the historic Kusakabe Family has long been a popular tourist attraction since it opened to the public and remains unchanged from the days in which the family resided there. Among its numerous highlights is not only its magnificent architectural style with dynamic beams and post columns, but also the fireplace and various exhibits that demonstrate how the family lived in those days, as well as the elaborate Buddhist alter, which is said to have cost 1 million taels to construct. More recently, we have proposed the museum be not only seen, but heard to breathe additional life into the experience while preserving its long, precious history. This takes the form of music events, which take advantage of the resonance in the double height hall. 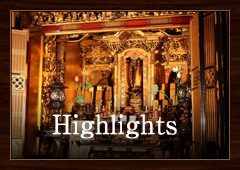 Enjoy a relaxing time in this museum filled with history, and find yourself a piece of the nostalgic historical drama while feeling the warmth of people in Takayama. Copyright (C) 日下部民藝館. All Right Reserved.